When designing your office or wider work environment, it is important to consider functionality and atmosphere as well as pleasing aesthetics. Corporate wall art offers so much more than a way to break up a blank wall or a pop of colour, it also goes a significant way towards improving productivity and employee wellbeing. There are many things that add interest and inspiration to an office space. Sculptures offer presence, plants offer life, furnishings offer comfort. But nothing offers so many subtle notes of interest and creative encouragement as a well curated art collection for your place of work. Office design should not be scrimped on. Workplace design is about so much more than a successfully functioning physical space, your design should also offer stimulus for the brain in order to spur on productivity. Colour is a really effective way to do this. In a space that is light and flowing (as is the desired effect for many work places), moments of colour help to add dimension and vibrancy to the space. Corporate wall art comes in so many variations, with so many styles, impressions and artists to choose from, both local and international. 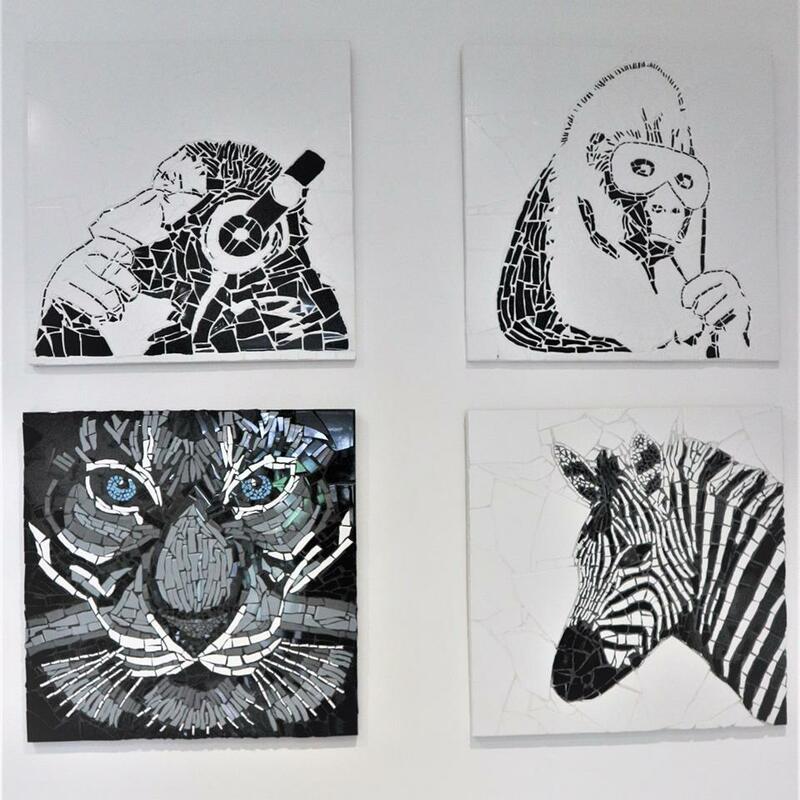 Pangea’s wall art range includes animal mosaics and 5 different animal head wall art. Every company wants to appear unique and standout, and wall art is a wonderful way to do this. Not only is there a piece out there to fit any company ethos or personality, but the one-of-a-kind nature of art means that the feel of your workplace will not be replicated anywhere else. Art has a reputation for fuelling debate. Healthy debate is an important business skill, and thought provoking art is a fantastic way to encourage the practice of this skill. Our African based art pieces have a great back story which you can find out more here. Anything that encourages communication in your place of work is a bonus, especially in a world where it is not unheard of to reach someone through a device when they are physically sitting in the same room as you! Art fuels face-to-face communication about a subject that requires critical curiosity and abstract thinking. We all know that first impressions are everything. These first impressions start at the front door of your workplace, way before they have met you or any of your staff. Therefore, your lobby, or entrance all should have maximum impact on the visitor. We have talked about how art can convey the ethos and personality of your business. When a new client is waiting in your reception area, they will be looking around for signs of who you are as a business. Art not only brings a room alive, but it also shows that you care about your place of work, that you are committed to quality in every corner of your business. The right piece of art in the right place can say a million positive things about you before you even shake a hand or say a single word! For more gifting ideas, or to peruse our ever-evolving sculpture range, check out the rest of our site HERE. Questions,doubts,issues? We're here to help you! None of our operators are available at the moment. Please,try again later.